The Environmental Protection Agency could deliver a huge Christmas present to climate deniers. Humorless ghoul Bob Murray, a billionaire who runs one of the largest independent coal mining companies in the U.S., told E&E News that the agency is weeks away from announcing a formal effort to undermine climate science. The effort will involve setting up a team of climate change deniers and a team of actual climate scientists to debate climate change. The exercise—known as a red team, blue team exercise—is not an exercise in science. It is an exercise in nihilism and one that is likely to completely lack rigor. But it’s likely underlying purpose is devilishly targeted at undermining the endangerment finding that carbon dioxide is a pollutant. If that finding gets repealed, EPA chief Scott Pruitt would be free to wash his hands of climate regulations even quicker than he’s already doing and watch the world burn. That this is even being considered shows how off the rails the EPA is under Pruitt. But then of course this is what happens when you elect a climate denier and he appoints a climate denying cabinet. The EPA told E&E News there were no updates on if an announcement was imminent, so it’s possible Murray is having a moment of magical thinking or is trying to force their hand. But the fact that this idea has been floating around for months means it’s likely we’ll see it implemented (or at least an attempt to implement it) at some point under Pruitt’s tenure. The red team, blue team concept is popular in military circles. I’m sure that’s great for mission planning, but applying it to science is dumb and redundant. There’s already a little process called peer review where scientists critique each other’s work until it passes muster, only then can it be published. It’s through this process that the vast majority of scientists have come to accept the preponderance of evidence that human carbon pollution is responsible for climate change. They also accept the evidence that it’s likely to get a whole lot worse if we don’t cut said carbon pollution down to something like zero in a timely manner. What Pruitt, Murray, and their ilk want is a politically motivated exercise that has no foundation in the scientific process. The deniers have lost the scientific debate. Their ideas have not held water because they lack rigor, not because of some Illuminati science conspiracy crap. But in the political arena, they carry a lot of weight for a Republican ruling class that wants to rend every last drop of oil and every last hunk of coal out of the ground that they can. That’s why Pruitt wants to manufacture a level playing field—so it seems like there are equal numbers of climate change deniers and scientists who accept the science of climate change. On Thursday, we got a preview of some of the people who will probably be on Team Denier. Conservative “think” tanks the Heritage Foundation and the Texas Public Policy Foundation hosted the Crossroads Summit, which featured a mashup of insane arguments that climate change isn’t happening (it is), that it is happening but due to solar cycles and water vapor (it isn’t), that carbon dioxide is good for the earth (also a no) and that we have a moral obligation to burn fossil fuels (we don’t). 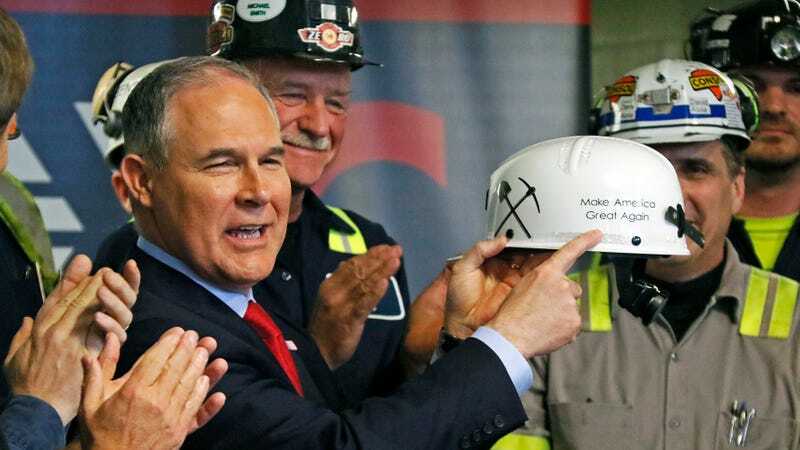 None other than Pruitt himself gave the opening remarks during which he baldly lied—saying the economy has contracted for the past few years despite steady growth since 2009—and railed against the Clean Power Plan, which he’s currently trying to repeal. Murray also spoke, saying “we don’t have a climate change problem,” which lol OK, Bob. But a 90-minute panel in the afternoon titled “Is CO2 a Pollutant?” is where the real tell was for who Pruitt’s red team might be and what their arguments are. Craig Idso, who with his brother and father runs a climate denier nonprofit, turned out the ol’ chestnut that carbon dioxide is plant food. Pat Michaels of the libertarian Cato Institute point blank said the way to repeal the endangerment finding was find issues with climate models that, despite what he claims, have been overwhelming accurate in modeling global temperature changes to date. Then there’s retired Princeton physicist (not of the climate variety mind you) who just, well, I don’t even know what the hell is going on with him. Here are a few of his slides. In short, these are not Serious Climate People. They are obfuscaters and hacks. And it’s the best Pruitt can muster if he wants to overturn the EPA’s endangerment finding. Put together, their arguments make no sense. But my guess is that’s exactly what Pruitt is hoping for. Muddying the waters with a public debate will shore up support with the base and could make enough people on the edges unsure enough to reduce outcry should he try to overturn the finding. If he does, it would surely be challenged in court by any number of groups. But it’s highly unlikely any judge that hears it will be a climate science expert. Having a few people with PhDs who work from science-sounding think tanks could bolster Pruitt’s case enough. And even he loses in court, the well of public discourse will already have been poisoned enough to slow climate regulations, and let people like Bob Murray rend the last few dollars out of the fossil fuel economy before the carbon bubble pops.